The Digital Series metering pumps from Walchem Corp., of Holliston, Mass., are designed to work with a wide variety of chemicals and metering applications. 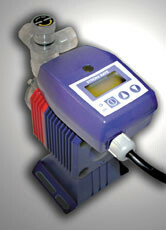 These solenoid-driven diaphragm pumps have a maximum capacity of 3.2 gph (12.1/h) and a maximum pressure of 150 psi (10 bar). Combining a 360:1 turndown ratio with high stroking speed and a fixed stroke length design make the Digital EZB pumps the most economical solution to applications requiring low cost but high turndown capabilities.